As more individuals and families are setting up their philanthropic foundations, there is increasing concern about effectiveness of the private foundations and their ways of giving. 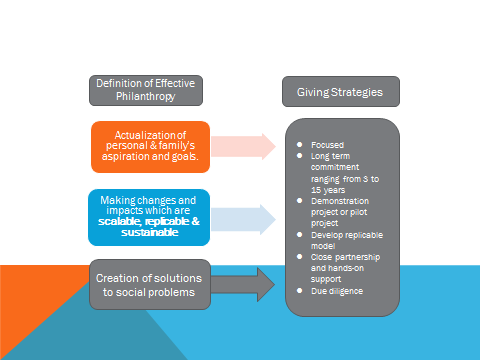 The research will help explore how private philanthropic foundations define “effective philanthropy” and try to understand their strategy of giving. It is believed that good practice of giving will be identified which will help benefit not only the philanthropic foundations, but also the non-profit sector, and the overall society as a whole. With the support and network of different foundations and their executive staff, we have successfully conducted in-depth interview with 8 private foundations, including 7 family foundations and 1 individual foundation. 3 donors and 5 senior executives of the foundations have been interviewed. Among the 8 private foundations, 3 focus mainly in China, the other 5 focus only in Hong Kong. Their range of history ranges from 1 year to 33 years; annual grantmaking varies from HK$1 million to HK$35 million, with only 1 working staff to more than 10 staff. Out of the 8, 2 are operating foundations, 4 are grantmaking foundations, 1 with a mixed nature, while another one is transforming from operating foundation to be grantmaking. Different foundations have different areas of interest, including 1) Health and Education in China; 2) Poverty in China Rural Area; 3) Elderly and Child; 4) Art & Culture; 5) Poverty in Hong Kong; 6) Support for Cancer Patients; 7) Support to NGOs and 8) Promotion of Buddhism. More detailed analysis will be conducted in the coming months for identifying good practices of effective philanthropy.